The Pace Autocruise Campervan is a great 2/3 berth camper ideal for couples and couples with one small child (not ideal for a 3rd adult, as the 2nd bed measures 5ft7 in length). 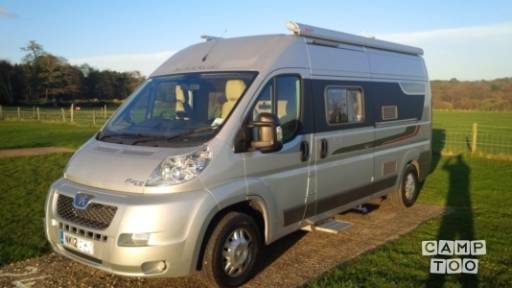 Our Pace Autocruise Campervan has everything you need for touring the UK. The interior is comfortable and practical with a great layout. The low profile of the Campervan means that it is fantastic on fuel, it delivers nearly 40 mpg at a steady 60 mph. Whether you need a vehicle for everyday use or a holiday the new Autocruise Pace is incredibly versatile. The layout is the first of its kind from a UK manufacturer and is capable of carrying up to four people and offers flexible space with a large transverse rear bed. This can be fixed or folded up, allowing storage under the bed or between the two bed bases for larger items, enabling you to accommodate anything from general luggage to camping or sports. In addition there is a front dinette that also converts into an occasional small single bed (for a child), that could sleep one or two small children, small sized washroom with toilet & showering facilities (hand shower in the toilet area) and a well-equipped kitchen (pots, frying pan, plates, cutlery for 3 people etc), so just bring along your pillows and duvet/sleeping bags or you can also rent them from us. Je kan de camper ophalen in Headley bij Steve. Je kan je auto hier gratis parkeren.